​Meet our little Carter!!! He will be 8 years old in December, our youngest child and our only affected child of PMD. Carter is a very happy, content, loving child despite his disabilities!!!! He is affected much more physically than mentally or medically. His passion is school and physical therapy!! 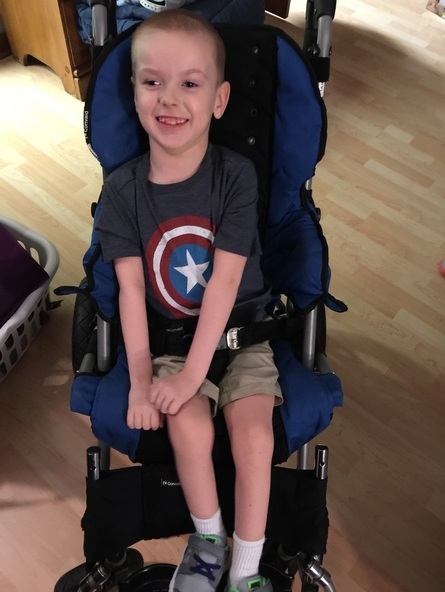 He walks in a gait walker at school and loves the independence and freedom it gives him. He's very attentive and learns very easily!! I get routine reports from his teachers and therapists to tell me of how much he is learning and how well he is doing. He has made our family mostly his siblings and my husband and I better people for sure and has taught us many things!!! He is truly a BLESSING from GOD than many would see as a burden. My son is the farthest thing from a Burden. As of now his only main medical issues are respiratory which we and his wonderful Pulmonary team at Peyton Manning Children's Hospital stay on top of and by the grace of God always seem to succeed and God willing we continue to do so. In 2015 we choose to give Carter a feeding tube, I was hesitant to so at first thinking this meant he was declining but that was not the case. He was slightly aspirating when eating by mouth and was having trouble gaining weight. So the doctors explained this would help both issues. He could still eat minimal by mouth and reduce aspirations and enjoy is food and he would gain weight which would increase is strength and immune system. It has been on of the best decisions we have made for him!!!! I love my little man as rotten as he is. One of my favorite things about him is his since of humor. I love to hear his deep belly laugh and see that smile. He actually told his mamaw NO for the first time last night!!! Which is usually not something you want your child to tell his grandma but we were all thrilled. We have 3 other children: Aly who will be 17 in November and she just won a battle with Hodgkin Lymphoma and is doing well. Kreyton, our son whom would be 12, that we lost in January of 2015 due to a tragic car accident, and Kambryn our 9 year, she's been trough so much in the last 20 months with her siblings she really struggles emotionally but is strong and doing well.